Home > Used Vehicles > 2010 Hyundai Santa Fe Limited,AWD,LEATHER,SUNROOF,AIR,TILT,CRUISE,PW,PL,LOCAL TRADE!!!! 2010 Hyundai Santa Fe Limited,AWD,LEATHER,SUNROOF,AIR,TILT,CRUISE,PW,PL,LOCAL TRADE!!!! Cylinders: 276HP 3.5L V6 Cylinder Engine - 6 cyl. Bluetooth, SiriusXM, Aluminum Wheels, Steering Wheel Audio Control, Air Conditioning! On sale now! This vehicle was originally listed at $13900. We've marked it down to $12900. You save $1000. This 2010 Hyundai Santa Fe is for sale today in Edmonton. Hyundai designed this Sante Fe to feed your spirit of adventure with a blend of versatility, luxury, safety, and security. It takes a spacious interior and wraps it inside a dynamic shape that turns heads. Under the hood, the engine combines robust power with remarkable fuel efficiency. For one attractive vehicle that does it all, this Hyundai Sante Fe is a smart choice. This SUV has 128050 kms. It's glacier white pearl in colour. It has an automatic transmission and is powered by a 276HP 3.5L V6 Cylinder Engine. 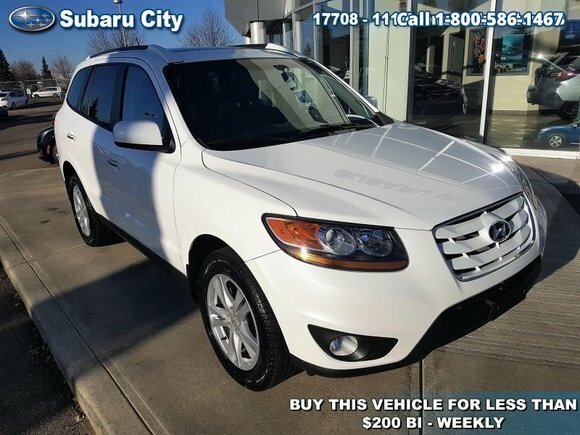 This vehicle has been upgraded with the following features: Bluetooth, Siriusxm, Aluminum Wheels, Steering Wheel Audio Control, Air Conditioning, Fog Lamps. Buy this vehicle now for the lowest bi-weekly payment of $184.08 with $1438 down for 36 months @ 6.99% APR O.A.C. ( taxes included, $790 Administration and Secure Ride included / Total cost of borrowing $1421 ). See dealer for details. Want to try the 2010 Hyundai Santa Fe Limited?